Putting an outfit together can be like a work of art. You start off with the base and add the detail. Detail can be in your accessories, fragrance, watch, shoes… or your socks. They are the middle man between shoe and trouser, complementing colours, textures and patterns. Picking the right pair means not only do you feel super comfortable throughout the day, but your outfit is put together perfectly, so if you trouser happens to rise up a little you’re still looking dapper from head to toe! One day last week a little box found it’s way through my post box and I was very excited to open it. The lovely guys at The London Sock Company sent me three of their wonderful socks with various designs and colours. I was so excited to find shoes to pair these socks with… so let’s not waste no more time and show you my trendy, dapper combinations. Okay yes you spotted it, I’m showcasing these without any trousers on! But I thought it would be the best way to show how beautiful these designs actually are, from the exquisite stitching to the perfect comfortable fit. Now let’s talk about how these socks are actually made, because when I read into it a little bit more… I was surprisingly intrigued. The guys at LSC believe it all starts with finding the right, quality yarn. They say your sock goes through the most friction out of any piece of clothing on your body so it must be durable and strong to endure wear and washing. Then the design is all done by specialist circular knitting using advanced technology to give higher needle counts for strength, using multiple threads for that eye catching knit pattern. There are over 1000 lines of stitching in one sock and you can literally feel the quality and difference this makes. The sock then goes through a thorough quality check before the logo is embroidered onto the side giving it that iconic LSC look. The quality doesn’t stop there. As you can see from the first picture, the pairs come in a solid box… the perfect gift for any man. 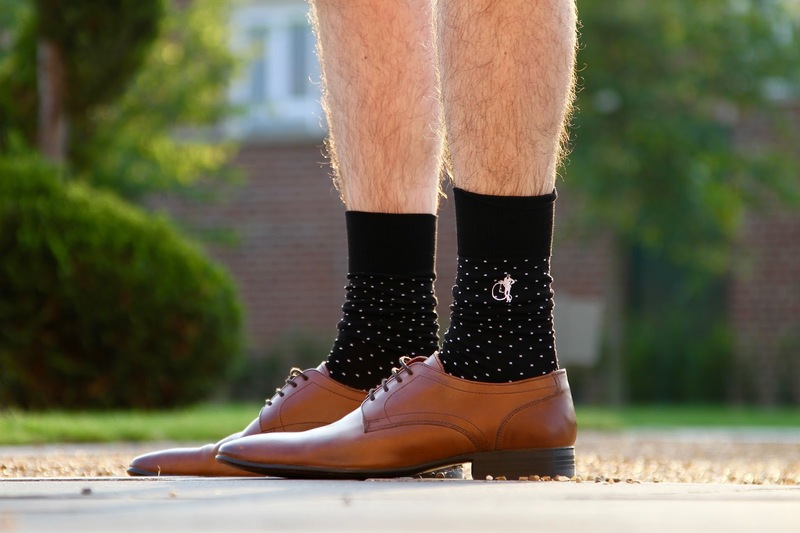 These socks have been on the feet of celebrities such as Daniel Craig and David Gandy, two dapper gents indeed! I tried to vary the style of each sock with a different pair of shoes. 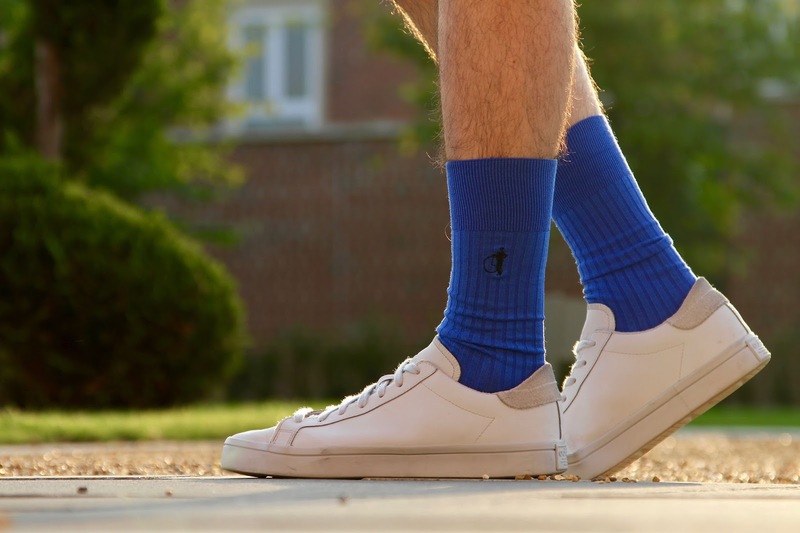 The first pair were a beautiful royal blue colour that I think went perfect with a nice white pair of sneakers. This made the socks really stand out, contrasting against the bright white. It brings me back to school when we would play sports in the playground having these two contrasting colours. Next up was the bold red. This was the perfect combination with a pair of my Kurt Geiger Dress Shoes. I think the combination is just right and would look amazing with an all black or grey suit. 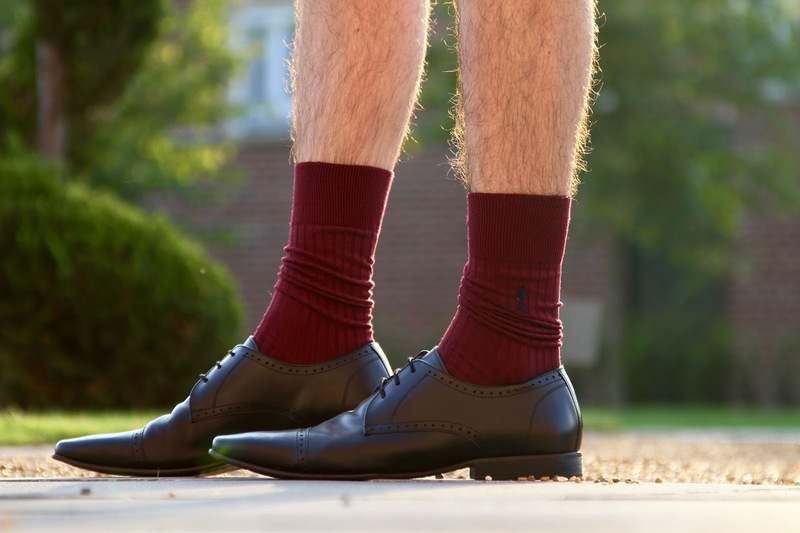 The red socks would separate the dark colours, making a bold and contemporary statement. Finally, this dotted black pair had to be put with some favourite shoes of mine, these Oliver Sweeney Tan Dress Shoes. Although black and tan wouldn’t be a usual combination of mine, I think the two colours go really well and the pattern on the socks stands out against the smooth leather of the shoe. This would look great with a navy suit, or charcoal grey. Did someone say subscription service? Yes, these socks are available to be sent right through your door every month. Choose either 1, 2 or 3 pairs and you will have a fresh pair for each month of the year. I think this is a great idea, especially for someone like me who doesn’t switch up and replenish my socks as much as I should! You can always guarantee on a new pair (or three) coming right through your letter box. They call this ‘The Sock Club’. Find out more about that here. Oh, and one more thing. Getting married soon? 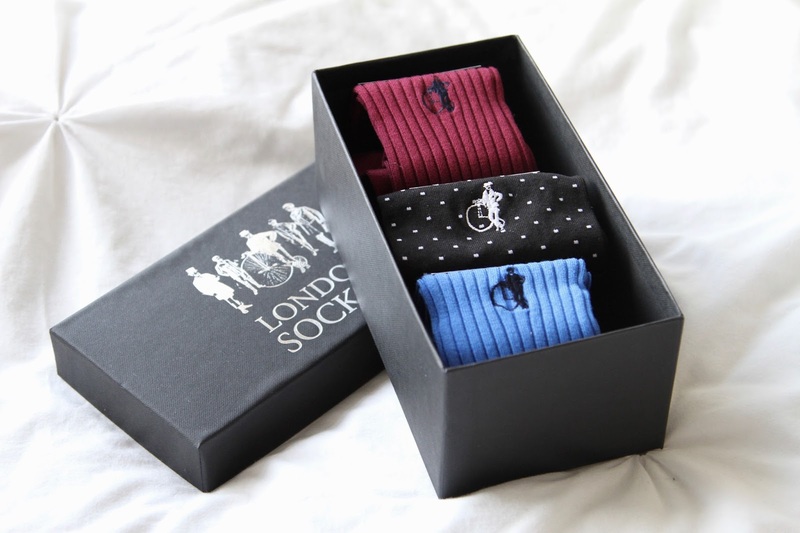 The London Sock Company can give you a bespoke service for you and your groomsman to get the perfect pair of socks for you all. Any combination, colour, style… all gift wrapped ready for your big day. I think this is just the perfect touch to one of the best days of your life. They call this ‘Big Day, Little Details’. And that’s about it! Who thought socks could be so interesting ey? I think these are the perfect gift for yourself or for someone else, so next time you’re buying for that person who seems to have everything…. why not surprise them with something so beautiful and functional at the same time! 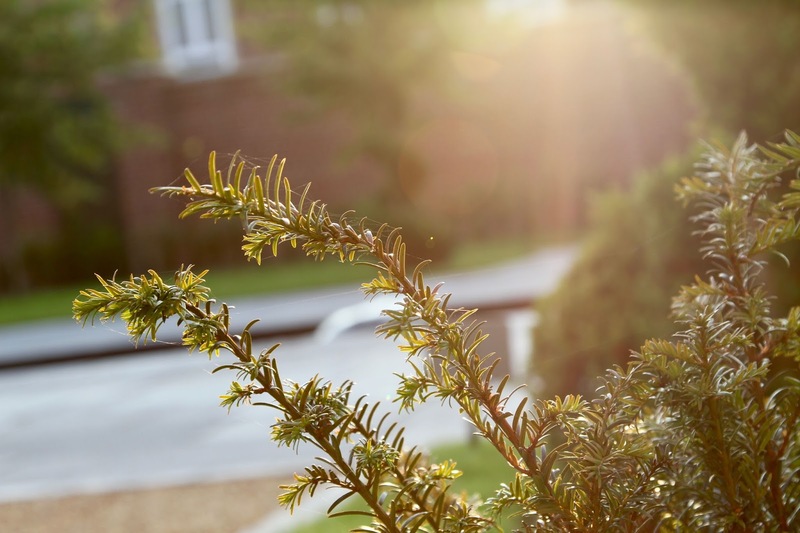 Find out more about gifts here. Which sock combination is your favourite out of the three? Previous Post Wash Bag Heroes.